Since this is a cruise issue it did seem a good idea to also include an ON TOUR which highlighted a destination accessible from not only the sea, but land and air also. And from two countries which must be pretty unique. 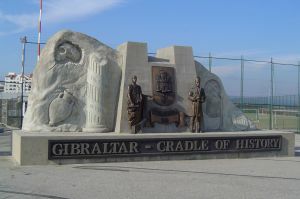 Gibraltar has been British since the 1713 Treaty of Utrecht when the Spanish signed it over “in perpetuity”. Since those far off days Spain has from time to time got somewhat niggled about the tiny 2.6 square miles of land owned by another country (it is officially a British overseas territory and as such part of the European Union). They really do not have grounds to complain as Spanish Ceuta and Melilla, physically linked to Morocco, likewise thrive as offshore enclaves. Britain says it will hand over when the majority of its citizens vote that way. At the last referendum 97% wanted the status quo to remain. Over the years the Spanish have attempted to take over “Gib”, and in particular The Great Siege of 1779-1783 (more anon), but the pragmatic Fascist Franco refrained from marching on “The Rock” during WWII. Seemingly the days of antagonism and border friction are over with work well on the way rebuilding the airport terminal incorporating a tunnel under the runway and new customs and immigration facilities. 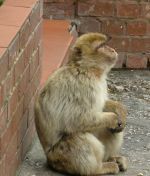 Gibraltar works on central European time, the same as Spain. Portugal and UK are one hour behind. One concession it could make without doing any damage at all is to change from right hand drive to left. Virtually all the cars that are seen in the enclave (one suspects that the Governor’s vehicle has the chauffeur in the right hand seat) are of continental origin with the driver on the right. It would be safer for all concerned, drivers and pedestrians alike, to change over. And it would not cost much. Sterling is legal tender and is at parity with its Gibraltar namesake. Arrivals by sea normally dock at the simple but effective cruise terminal which can easily take two large ships at once. Taxis wait outside and a two-hour tour costs around £40 for four, good value with the drivers very knowledgeable and most skilled at navigating their way as high as it is possible to go up the actual Rock. Negotiate if you want your driver to wait while you visit points of particular interest. Air services to Madrid were tried and failed several years back, but might work once the runway is sorted out. BA and easyJet fly from Gatwick, while Monarch operates from Luton. Malaga, 80 miles away, is an alternative. From the cruise terminal and airport it is but a ten minute walk to Casement Square, the main socialising centre in the colony, with many, many cafes, restaurants and shops and the home of the local tourist board. From the airport, once you are across the runway, the distance is much the same. Your choice of hotels is limited. There are five and none of them are large by international scale although the standards are excellent. Many visitors stay in Spain and commute in. On Main Street is the four-star Elliot Hotel, 129 rooms, rooftop swimming pool and conference facilities. Also four-star is the establishment offering, The Rock, close by the cable car and botanical gardens in a prominent position offering panorama views with lovely gardens and a swimming pool. On the other side of Gib is the Caleta, 180 rooms, also four-star, more of a holiday hotel with a saltwater swimming pool and access to the beach. The Queen's is a small purpose-built three-star establishment at the southern end of Main Street just outside the city walls. The Continental is actually in Main Street and is a basic two-star operation with 17 simple rooms. What to do is easy. 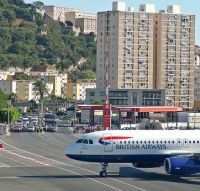 If you are at Gib for the day you can either shop (it is tax free and very cheap by current European standards) or, as mentioned, take a taxi tour. Most people manage to somehow combine the two. Your taxi trip will probably first take you to Europa Point at the southern most tip of the peninsula where there is a lighthouse and a Mosque to support the 2,000 Muslims who now live on the Rock. The voting population is 14,000 out of 29,000 inhabitants in total. The Jewish population is around 600 and there are four Synagogues. From the lighthouse the next point of interest is the Moorish Castle which dates from the 13th century. From there it is along narrow and potentially dangerous roads up the Rock itself to either the Great Siege Tunnels or St Michael's Cave. 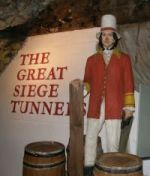 The tunnels were first excavated in around 1770 but were much extended by Canadian mining engineers during WWII and are said to extend 32 miles in length underground. During the conflict they served as a command post, barracks and a hospital. It is a fascinating walk and more and more are being opened up all the time. Dress warmly. And the same goes for St Michael’s Cave, a natural phenomenon, which includes an auditorium and some tricky walking as you admire the numerous stalactites and stalagmites in the cave formed by an accumulation of traces of dissolved rock deposited by water dripping from the ground above. For those with more time an introduction to caving and potholing is one of the activities organised by the tourist board. Just be careful with the Rock Apes. Some of the world’s finest pickpockets! The King’s Bastion Leisure Centre offers an array of leisure activities such as the King’s Bowl & Bar (14-lane bowling and four-lane junior bowling), the Rock Bastion Restaurant, the Amusement Arcade, an internet lounge, an ice rink with a 50-person capacity and two-screen cinema. Nightlife in Gibraltar is limited although there are numerous bars and restaurants. Ocean Village is a quality 24-hour casino and dining complex.